The 9th Annual GBC Motorsports Heartland Challenge was yet again a big success, as racers and spectators from across the country descended on Carlisle, Iowa for the “Most Challenging ATV/SXS Race in America.” A total of 155 teams from 21 states, Canada, and the UK competed across 21 classes for their Heartland Challenge trophies, cash payouts and bragging rights for the next year. Racers and spectators began to roll through the gates on Thursday, pitching camp for the weekend and checking in with race organizers. 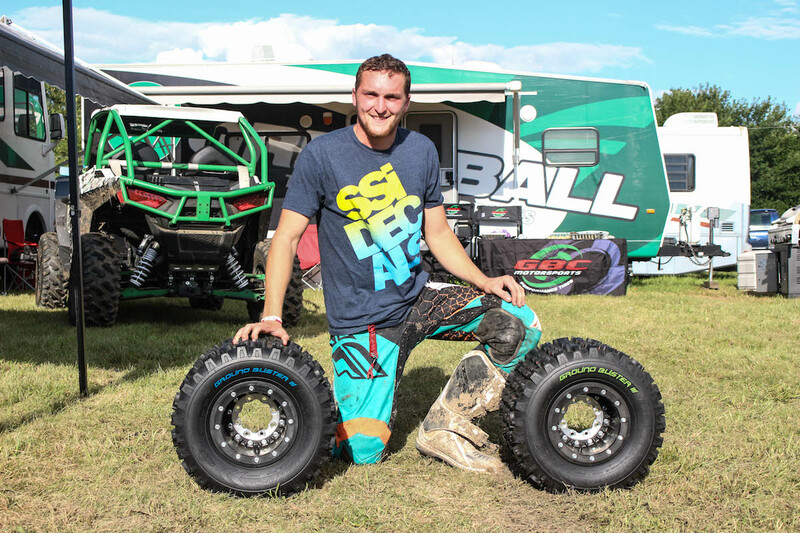 On Friday, those in attendance were the first to see the latest ATV tire from GBC Motorsports: the Ground Buster III. This cross-country rear tire for sport ATVs was designed to handle the varied terrain of race series like the GNCC, and is offered in 2-ply rated and 6-ply rated versions. As the afternoon rolled around, competitors for the 1.5-hour Polaris Ace Challenge lined up at the starting area for the first of the weekend’s four events. With the field expanded to three Ace classes this year, allowing for 325, 570 and 900cc displacement motors, the single-seaters departed onto the Heartland Challenge course. After 90 minutes of racing, Team UXC Ace #1 was the victor of the ACE 900 class and the overall top finisher. Dennis Michael Racing put forth two teams in Ace competition and came away with two class wins in the 325 and 570 classes. A Polaris Ace makes its way through some obstacles. While the Ace machines whizzed around the course, the rest of the racers and spectators took their turn in line at a spaghetti dinner put on by GBC Motorsports. 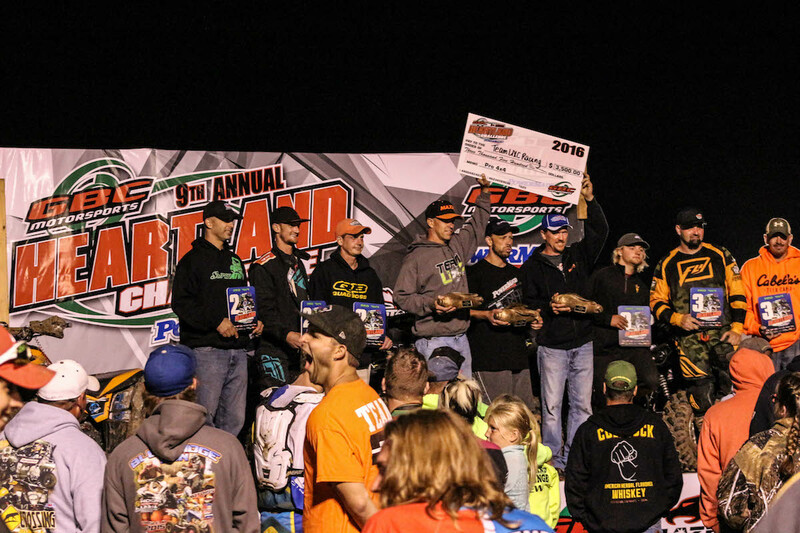 The Heartland Challenge is first and foremost a family event meant to bring people together in celebration of racing and the outdoors, and this family-style dinner was but one way GBC could show their appreciation for the people that make it all possible. As afternoon gave way to evening, race organizers learned that a big storm was headed their way. 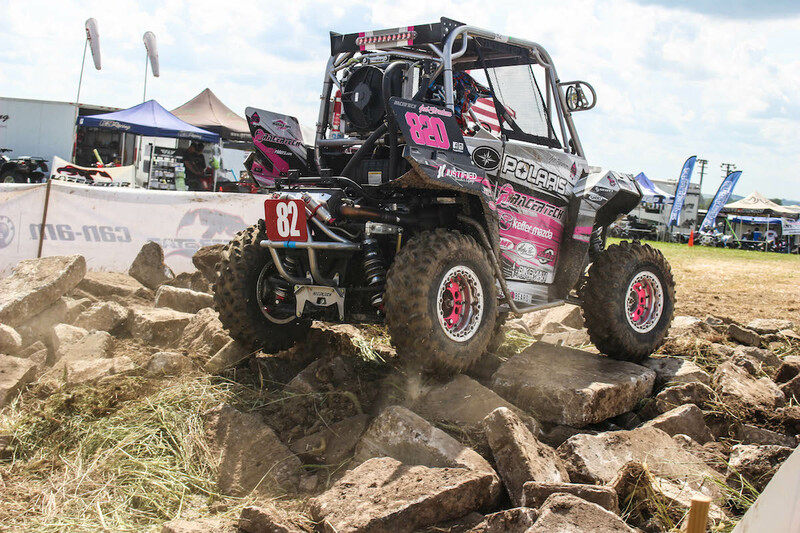 After last year’s Adult UTV race was cut short due to lightning and heavy rain, the organizers were eager to get as much racing in before the sky opened up. The announcer called all UTVs to the starting area earlier than planned. 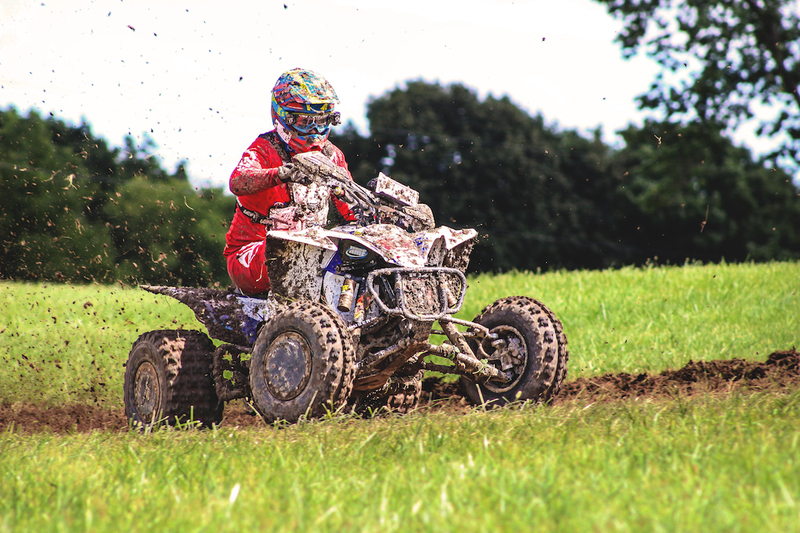 Nearly 70 UTVs would compete in the 4-hour challenge, and with the sounding of an air horn the rows of UTVs rumbled out of the starting area onto the course. Perhaps the most exciting racing of the weekend took place in the UTV Challenge, as three different teams battled for the lead throughout the final hour. 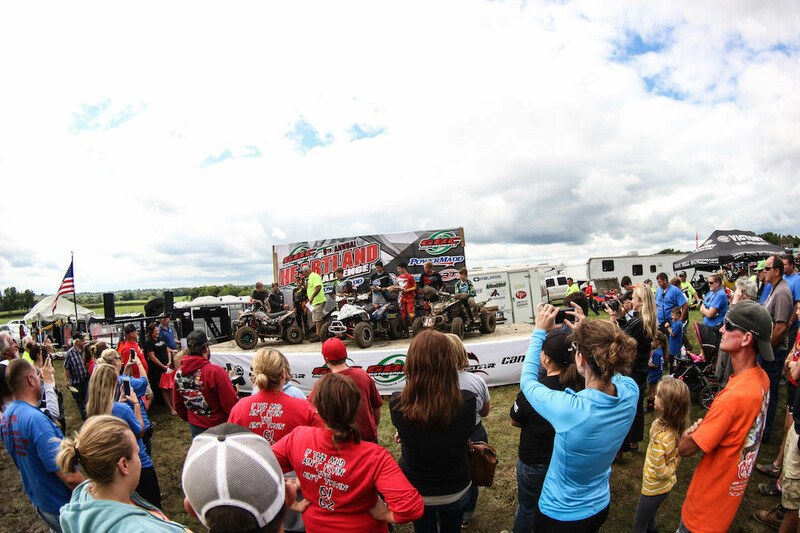 Team Miller Bros Racing took the UTV 1000 class win and the UTV Overall. 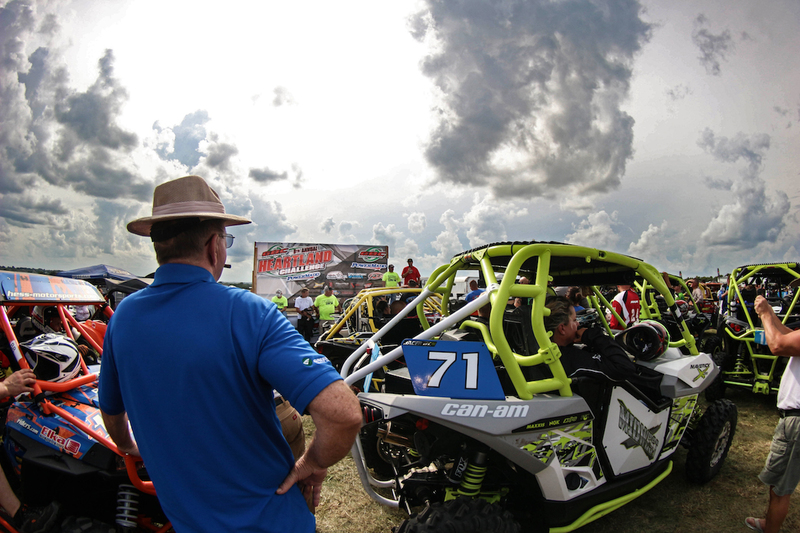 Racers arrived at the finish line before the storm did, and when all was said and done Team Miller Bros Racing from took the UTV 1000 class win as well as the UTV Overall top spot. 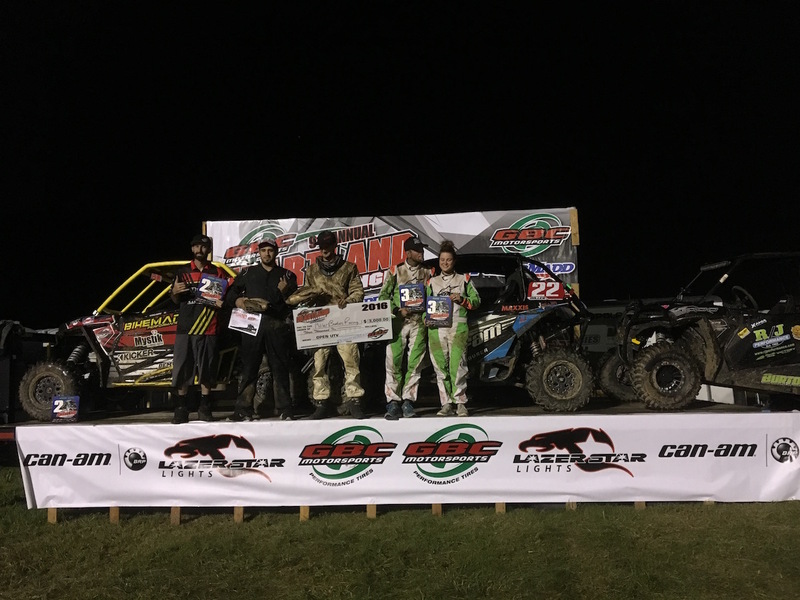 GBC Motorsports was well represented on the UTV 1000 podium, as both the 2nd and 3rd place finishers ran GBC Dirt Commanders to help them negotiate the course. 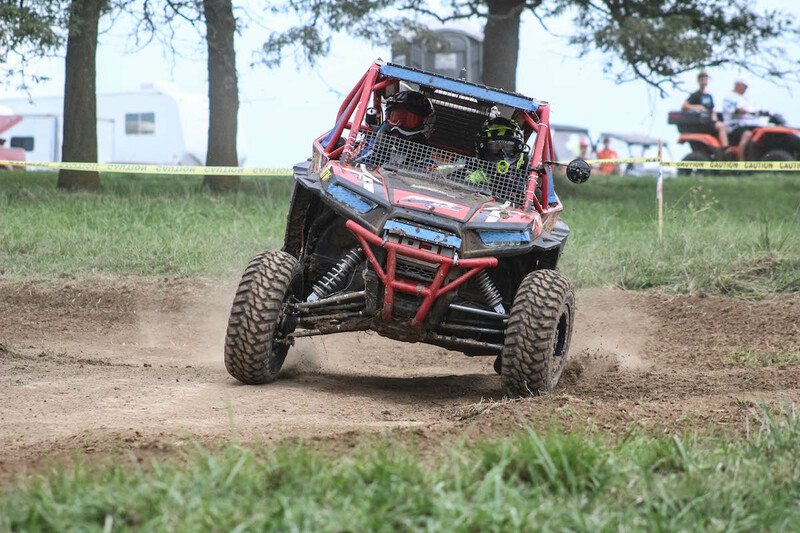 Team Brockway Racing won the UTV 900 class while Team White Knuckle Racing topped the UTV 800 class. The course was still muddy from rain the night before, but the Youth ATV Challenge carried on. 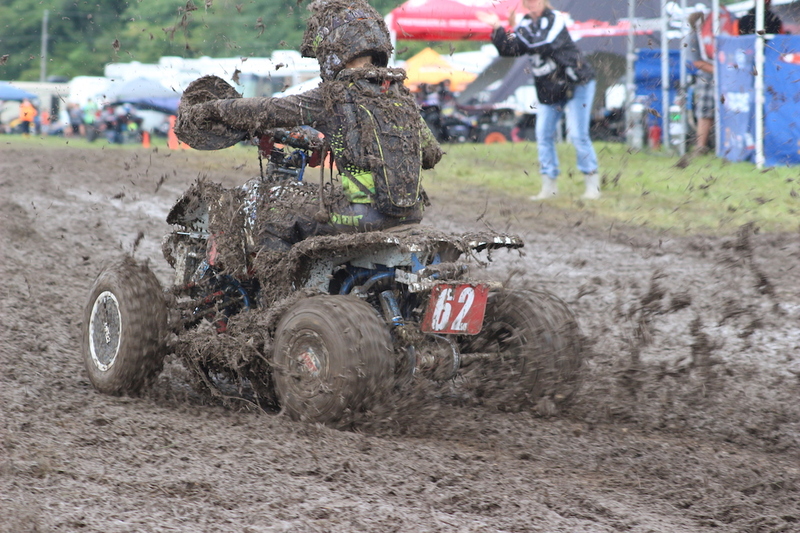 The rain did indeed arrive, thoroughly watering the course and delaying Saturday morning’s Youth ATV race as track workers cleaned up some of the muckier sections of the course. By mid-morning, the kids were called to the starting area and the Youth ATV Challenge was underway. 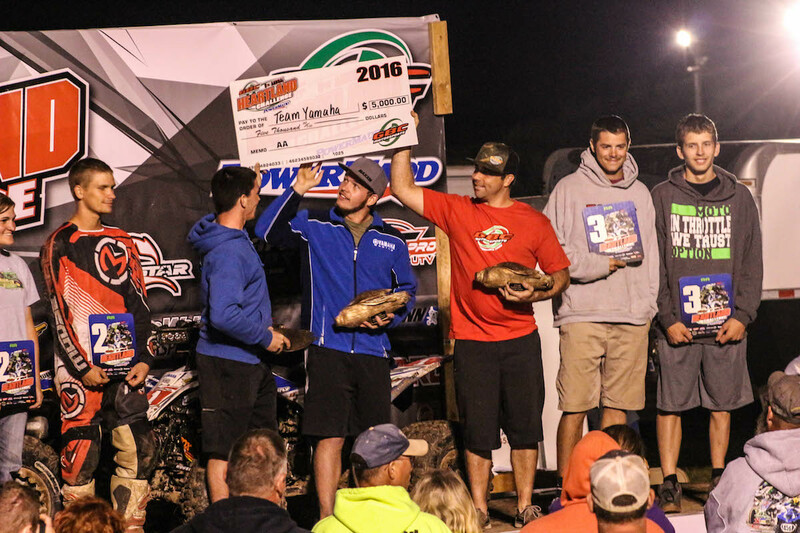 After 3 hours of battling through the rough and sticky track conditions, Team Variom Ackwardness from Freepark, IL crossed the finish line on top of the Youth 90cc Production class as well as the Overall Youth ATV Challenge. Team Top 3 Racing bested the Youth 90cc Stock class, Team M&T Racing took top honors in the Youth 70cc Production class, Team Triple Trouble was victorious in the Youth 50cc Production Class, and Team Tyler Valentine won the newly added Super Mini class. Team Variom Ackwardness won the 90cc Production class and the Youth Overall. As the day progressed the course continued to improve. Temperatures were mild compared to the heat waves endured at previous Heartland Challenges, making for what would be nearly ideal track conditions for the 10-hour Adult ATV Challenge. 68 teams would go head to head on the Heartland Challenge course, with 10 class championships up for grabs. Dalton Hicks was the winner of the pre-registration giveaway of a set of Ground Buster III tires. During the riders meeting on Saturday afternoon, GBC Motorsports announced the winner of the Ground Buster III drawing. All racers who pre-registered were automatically entered into this drawing for a set of GBC’s new tires, and GBC announced that Dalton Hicks would be among the first in the country to get a set of the new Ground Buster III tires. 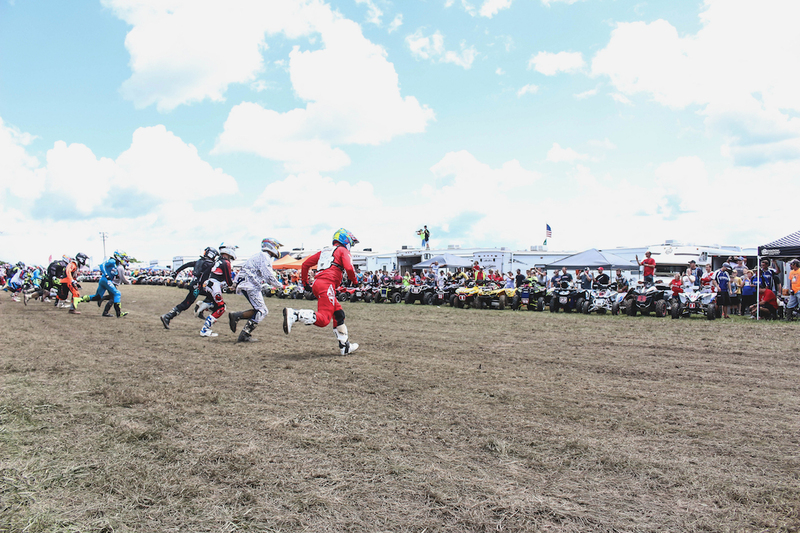 The Lemans-style start is always a crowd pleaser as racers must run to their ATVs before heading out on the course. Still running about an hour behind schedule, the group of ATV racers lined up for the Lemans-style start. The horn sounded and the dozens of athletes sprinted across the grass, fired up their ATVs and roared out onto the Heartland Challenge course. There they would face lap after lap of various terrain and obstacles, handing off piloting duties to their teammates as fatigue set in. Competitors would race through wide open grass fields into thickly wooded trail sections, across streams, and through the manmade Challenge Section of the course where riders would have to negotiate everything from boulders to logs. The Adult ATV Challenge ran for nearly 10 hours, testing both riders and machines in the process. For the second straight year due to the unpredictable weather of the Midwest, the ATV Challenge was cut short. 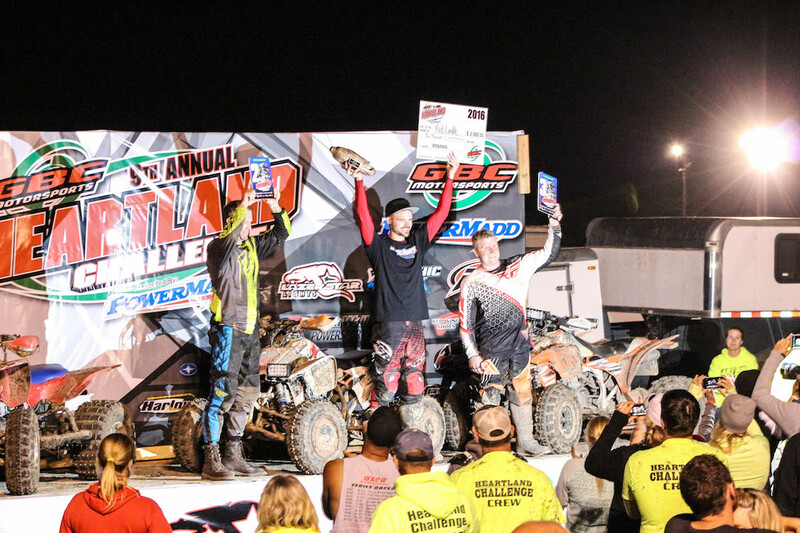 This time, it was the strict midnight curfew that loomed, and after nearly 9 ½ hours of racing Team Gallagher/Fowler/Richardson completed 47 laps to win the premier AA class and Adult ATV Overall. Team UXC Racing took the 2nd spot in the Overall and top honors in the competitive Pro 4x4 class. GBC Motorsports racer Matt Lindle defended his title, racing his XC-Master tires to the Ironman class victory. Team Yamaha defended their AA class title. Team UXC Racing won the Pro 4x4 class. Matt Lindle defended his Ironman class title. GBC Motorsports is a proud supporter of not only the Heartland Challenge, but many race series and racers across the country. To learn more about GBC Motorsports tires for ATVs and UTVs, their race efforts, contingency program and more, visit www.GBCMotorsports.com. Visit them on Facebook, Instagram and Twitter to get the latest updates.